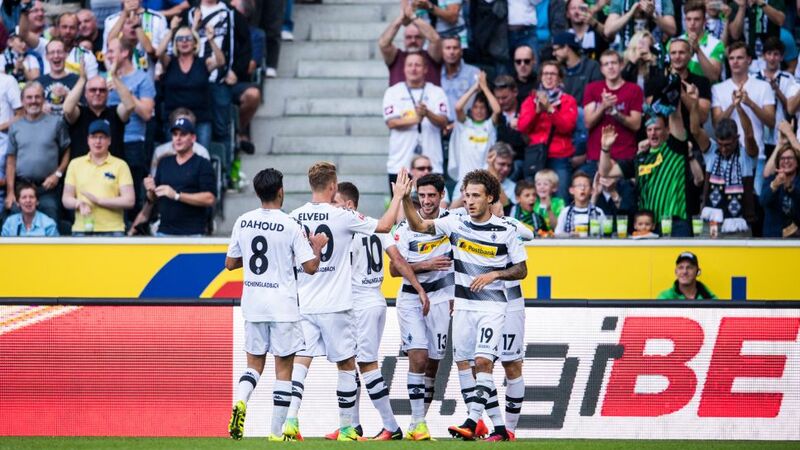 Borussia Mönchengladbach are on an impressive winning streak at BORUSSIA-PARK. Borussia Mönchengladbach’s home campaign in Group C of this season’s UEFA Champions League gets under way in mouth-watering style when they host FC Barcelona on Wednesday (kick-off: 20:45 CEST/18:45 GMT). Even without the injured Lionel Messi, Barca will be a stern test for Andre Schubert’s side with stars of the calibre of Luis Suarez and Neymar in their ranks. But the Foals should be confident, with a superb home record of 11 straight wins in all competitions ahead of Wednesday’s meeting. Put an in-form Gladbach star into your Official Fantasy Bundesliga team! This 11-game winning streak on home turf stretches back to 5 February, when SV Werder Bremen were seen off to the tune of a 5-1 thrashing. Gladbach have scored 37 goals over the course of this run, only conceding six, to turn BORUSSIA-PARK into something of a fortress. Under Schubert, Gladbach are a vibrant, attacking outfit to the delight of over 50,000 fans on their own patch. They burst out of the blocks to go 3-0 up over Bremen after just 21 minutes on Matchday 3 on the way to a comfortable 4-1 win, just the kind of form they will need when Barca show up. Striker Raffael looks set to return to the side after missing Gladbach’s last two Bundesliga matches with adductor muscle problems. The Brazilian grabbed four goals, including a second-leg hat-trick, in the Foals’ 9-2 aggregate win over Young Boys that eased his side into the group phase of the Champions League. He also scored twice in that 4-1 victory over Bremen, linking up well with the in-form Thorgan Hazard. Likely to be trying to thwart Gladbach’s attacking juggernaut is a familiar face to the home fans in Marc-Andre ter Stegen, making his return to his old stamping ground as Barca’s first-choice ‘keeper. He also scored twice in that 4-1 victory over Bremen, linking up well with the in-form Thorgan Hazard. Likely to be trying to thwart Gladbach’s attacking juggernaut is a familiar face to the home fans in Marc-Andre ter Stegan, making his return to his old stamping ground as Barca’s first-choice ‘keeper. Meanwhile Gladbach’s USMNT defender Fabian Johnson has played his part at both ends of the pitch. He is part of a solid-looking backline that is sure to be tested on Wednesday, and he popped up to grab his 10th goal since joining the club in 2014 that rescued a point at RB Leipzig on Matchday 4.